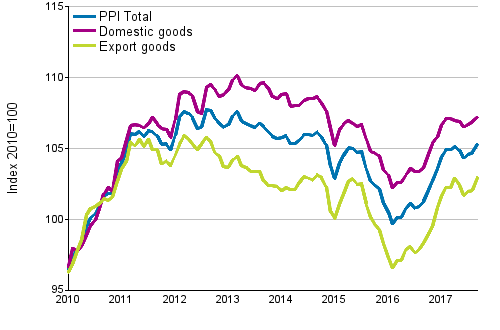 According to Statistics Finland, producer prices for manufactured products rose by an average of 4.0 per cent from September 2016 to September 2017. Producer prices for manufactured products sold on the domestic market rose by 3.4 per cent, while the producer prices of export products went up by 4.7 per cent. The increase in the producer prices for manufactured goods was particularly attributable to risen prices of manufacturing of basic metals, oil products and chemicals and chemical products from September 2016. The rising of producer prices was curbed particularly by falls in the prices of paper and paper products and printing services. The Export Price Index rose by 4.7 per cent and the Import Price Index by 9.3 per cent in the year. The Basic Price Index for Domestic Supply went up by 5.0 per cent. The Basic Price Index for Domestic Supply including taxes went up by 4.8 per cent. Export prices were, in particular, boosted by the higher prices of manufacturing of basic metals and oil products from September 2016. The rising of the prices was curbed particularly by fallen cost of paper and paper board. The rise in import prices was, in turn, especially caused by higher prices of oil products, metal ores and manufacturing of basic metals compared with the previous year's September. The rising of the prices was curbed above all by falls in the prices of electrical equipment. From August to September, producer prices for manufactured products rose by 0.5 per cent. The rise was mainly due to increased prices of oil products from the previous month. ISSN=1799-3695. September 2017. Helsinki: Statistics Finland [referred: 23.4.2019].